Singapore. 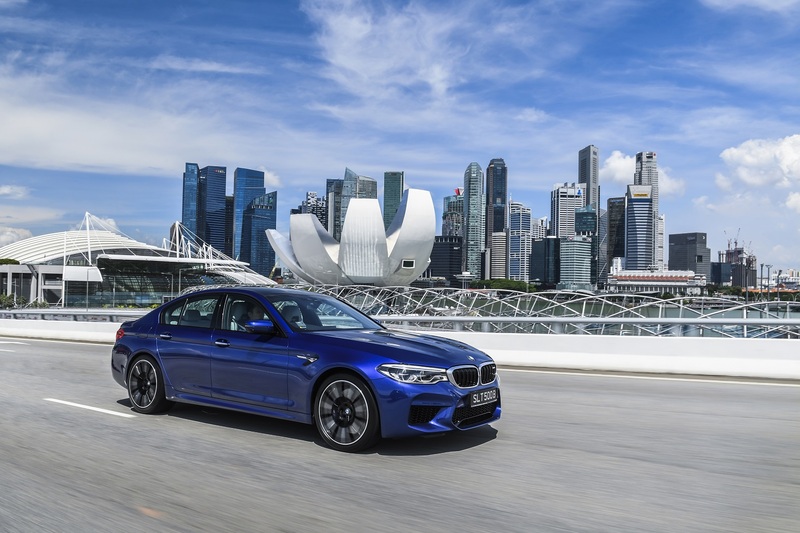 BMW Asia and Performance Munich Autos today launched the all-new BMW M5, a car that takes driving dynamics into a new dimension. Making its debut in the sixth generation of the high-performance sedan is the new M-specific all-wheel-drive system M xDrive. Not only does this drive system enable the M5 to reach new heights of dynamic performance, it means that it excels in terms of everyday practicality and delivers supreme poise in all driving conditions as well. State-of-the-art driving dynamics: the systematic evolution of the high-performance concept. The car’s ability to juggle complete suitability for everyday use on the one hand and sheer driving pleasure and superb track performance on the other is down to the M xDrive system’s central intelligent control capability. When the engine is first started, the all-new BMW M5 will be in all-wheel-drive mode (4WD) with Dynamic Stability Control (DSC) switched on. The driver is then able to vary the handling characteristics of the all-new BMW M5 by activating various driving dynamics modes, including a rear-wheel-drive mode with no DSC. In this 2WD mode, the all-new BMW M5 allows accomplished drivers to enjoy a pure-bred form of driving pleasure. Hard at work under the bonnet of the all-new BMW M5 is the latest and most advanced version of the 4.4-litre V8 engine featuring M TwinPower Turbo technology. Output of 600 hp and peak torque of 750 Nm promise supreme propulsive power and formidable performance. The twin-turbo V8 unit propels the all-new BMW M5 from 0 to 100 km/h in a mere 3.4 seconds, for instance. The task of relaying the drive power falls to the new eight-speed M Steptronic transmission with Drivelogic, which teams up with the M xDrive system to transfer the high-revving engine’s turbocharged might to the road to optimum effect in all driving conditions. The upshot of all this is that the all-new BMW M5 is not just the fastest of all the BMW M5 models built since 1984, but the most nimble too. M TwinPower Turbo, M xDrive and the eight-speed M Steptronic transmission: sublime drive power and supreme shift comfort. Following a thorough overhaul, the 4.4-litre V8 engine with M TwinPower Turbo technology is now more potent than ever. The high-revving power unit in the all-new BMW M5 delivers its exceptional output of 600 hp at 5,600 – 6,700 rpm, while the tremendous peak torque of 750 Nm is on tap from just 1,800 rpm and remains constant all the way up to 5,600 rpm. Compared to the outgoing model, maximum torque has been upped by 70 Nm. The engine characteristics can be changed at the push of a button from the basic Efficient setting to either Sport or Sport Plus, resulting in even more willing response to movements of the accelerator. Modifications have likewise been made to the cross-bank exhaust manifolds for the all-new BMW M5. This has the effect of optimising the transmission of energy from the exhaust gas flows to the turbine wheels of the two turbochargers and ensuring the best possible gas-exchange cycle. By fitting a Helmholtz resonator between the two silencers of the dual-branch exhaust system, the M engineers have succeeded in reducing its weight. The sound from the flap-controlled exhaust system varies depending on the selected mode for the engine characteristics, while the M Sound Control button also allows drivers of the all-new BMW M5 to soften its acoustic presence. The twin-turbo V8’s power is channelled to the road via the newly developed M xDrive all-wheel-drive system. The wonderfully nimble rear-biased set-up is achieved by the M xDrive system only bringing the front wheels into play when the rear wheels aren’t able to transmit any more power to the road and additional tractive force is required. Even when it is being driven in a particularly sporty manner and unleashing high levels of power, the all-new BMW M5 with M xDrive behaves predictably and can be controlled with ease by the driver, paving the way for an even more intense experience of the business sedan’s phenomenal performance. The principal hardware components of M xDrive are based on the BMW xDrive intelligent all-wheel-drive system and the Active M Differential, while the central M-specific driving dynamics control software takes care of orchestrating the various components to extremely innovative effect. The drivetrain has been reinforced for greater rigidity and strength to make allowance for the high torque, the rear-biased configuration and the 2WD option. While the transfer case splits a portion of the drive torque between the front and rear wheels in a smoothly adjustable ratio depending on requirements, the Active M Differential is responsible for then distributing the drive torque between the rear wheels. In the case of the active control element within the M xDrive system’s scope of functions, the locking effect is varied as the situation demands. This thereby ensures enhanced traction, agility and directional stability when the car is being driven in a very sporty manner or on roads with differing levels of grip – i.e. exactly when it is needed. With M xDrive, stabilising interventions from the DSC system are only required in extreme situations, enabling the engine’s tremendous power to be converted into propulsive force with virtually zero losses. The result of all this is that the all-new BMW M5 can be piloted with even greater precision and directional accuracy, responds sensitively and directly to the driver’s inputs and thus requires few steering corrections when driving at the limit. More ambitious drivers can configure M xDrive at any time to suit their needs. Even in the default setting with both DSC and 4WD activated, the all-new BMW M5 allows a certain amount of slip at the rear wheels when accelerating out of corners to produce the agility for which M models are renowned. But the all-new BMW M5 also remains perfectly controllable at all times. The all-wheel drive’s superior traction helps to produce acceleration times that are simply phenomenal by sports sedan standards and would be worthy of a super-sports car: 0 to 100 km/h in a breathtaking 3.4 seconds and 0 to 200 km/h in just 11.1 seconds. Switching to the M Dynamic mode (MDM, 4WD Sport) gives a further major boost to the car’s handling agility. Yet more drive torque is now directed to the rear axle, while the amount of permissible rear wheel slip is increased. This lets drivers put the all-new M5 into controlled drifts and enjoy its playful handling. While doing so, the onset of oversteer is noticeable in good time and the linear increase of the sideslip angle means that the vehicle remains stable even when driving at the limit. The three modes available with the DSC system switched off have been configured chiefly for driving on race tracks. The 4WD mode is set up for the greatest possible controllability and traction, and already offers plenty of scope for exploring the dynamic performance capabilities of the all-new BMW M5. The 4WD Sport mode, meanwhile, with its blend of supreme steering precision, delightful handling and reassuring traction, offers a sure-fire guarantee of unadulterated driving pleasure. The pure rear-wheel-drive mode (2WD) has been designed with the experienced and highly adept driver in mind. This opens up the same thrilling experience already offered by past generations of the M5 that of a high-performance sedan devoted to the art of generating driving pleasure with no control systems to hold it back. The M Steptronic transmission allows both fully automatic shifting and sequential gear shifts – using either the new short gear selector on the centre console of the all-new BMW M5 or the M shift paddles on the steering wheel. The transmission has been engineered for instantaneous response and lightning-fast gear changes in classic M style. The torque converter lock-up clutch is already fully engaged once the car has pulled away. Superior chassis technology: a new dimension in driving dynamics. Unbeatable driving dynamics with maximum directional stability – that was the goal of the team responsible for tuning the all-new BMW M5 chassis. As is usual for BMW M GmbH, the tuning took place in part on the company’s own race circuit at Miramas in the south of France, as well as on the world’s toughest test track, the Nürburgring Nordschleife. The precise, agile handling that drivers have come to expect from previous generations of the BMW M5 has been further optimised for the new car. Individual driver needs are met by the wide range of options for configuring the vehicle, including: M xDrive, the eight-speed M Steptronic with Drivelogic, the M-specific Variable Damper Control (incl. three driving modes: Comfort, Sport and Sport Plus) with electronically controlled shock absorbers and M Servotronic steering (incl. three driving modes: Comfort, Sport and Sport Plus). A top priority when tuning the chassis of the all-new BMW M5 was to achieve neutral steering behaviour, even at the dynamic limits. An important factor here is linear build-up of transverse loads across the full range of lateral acceleration. Whatever the driving situation, the electromechanical M Servotronic steering delivers exactly the right amount of steering torque. This ensures that the all-new BMW M5 has superbly accurate steering and always delivers clear feedback. What’s more, the car is great for long-distance driving, as well as being a joy in the city and on short journeys thanks to the low steering force required for manoeuvring and parking. The familiar double-wishbone suspension from the front axle of the BMW 5 series has been reworked from the ground up for the all-new BMW M5 with M xDrive. M engineers have redesigned every component to factor in M-specific kinematic and elastokinematic characteristics. Directional stability is greater than ever thanks to the increased track width. The five-link rear suspension has also been modified to meet M-specific requirements. New toe links featuring stiffer rubber mounts help accommodate the increased demands on the driving dynamics and steering precision, as do firmer anti-roll bars and lower wishbones that have been optimised for stiffness. Specially developed for the all-new BMW M5, the elastomer bearings on the rear axle mounts ensure that there is no delay in transferring chassis forces, which makes for superbly direct handling. An additional steel X-brace and an aluminium transverse strut increase the stiffness of the chassis linkages at the rear axle, resulting in improved response. Further chassis modifications not visible externally perform functions that are no less important. For example, an aluminium tower-to-bulkhead stiffening profile and two tower-to-frontend struts enhance stiffness at the front of the car. The tyres fitted as standard on the BMW M5 (20-inch seven-double-spoke wheels in Bicolour; front: 275/35 R 20, at rear: 285/35 R 20) have been specially selected. They are mounted on five-double-spoke cast light-alloy wheels in polished Orbit Grey (front: 9.5 J x 19, rear: 10.5 J x 19). All wheels are ZR speed rated, making them suitable for the top speed of 305 km/h achieved by the all-new BMW M5 with M Driver’s Package (standard version: 250 km/h). The all-new BMW M5 comes with M compound brakes fitted as standard. Being significantly lighter than conventional cast iron items, these have the distinct benefit of reducing unsprung mass. At the front, the braking force is applied to perforated, inner-vented brake discs by blue-painted six-piston fixed callipers featuring the M logo. Deceleration at the rear is provided by single-piston floating calliper brakes, also in blue, with integrated parking brake. M carbon-ceramic brakes are also available as an option on the all-new BMW M5. These are instantly recognisable from the gold-coloured callipers with M logo (six-piston fixed callipers at front, single-piston floating callipers at rear) and are 23 kilograms lighter, which means a further reduction in unsprung and rotating masses. This offers many benefits, including improved driving dynamics and increased suspension comfort. The M carbon-ceramic brakes provide even better braking performance than M compound brakes, as well as further improved fade resistance and even higher thermal stability. What is more, they withstand wear exceptionally well. Sporting M design with distinction: form driven by function. Like all the models to come out of BMW M GmbH HQ in Garching, its design is M-specific and driven by function. For example, the newly designed front bumper trim, with its larger air intakes, has the task of keeping the cooling systems and brakes sufficiently supplied with cooling air – even in exacting use on the race track. The car has a wider track than its predecessor, and the front side panels (made from aluminium to save weight) bear the signature M gills. Also hewn from aluminium is the bonnet, whose precise lines carve an eye-catching sculpture and extend visually into the shaping of the roof. In an M5 first, the roof itself is made from extremely lightweight, high-strength carbon fibre-reinforced plastic (CFRP). The interior focuses squarely on the driver; absolute control in all driving situations is the motto here. At the same time, the all-new BMW M5 offers space for up to four passengers, a large boot and excellent ride comfort. As a high-performance sports car and business sedan in one, it blends the best of both worlds. Equipment without compromise: the driver is at the heart of the action. When it comes to the equipment on board the all-new BMW M5, the dynamic driving experience is always king. The centre-point is the driver’s seat, from where all switches and buttons can be operated with optimum ergonomic convenience. All of the car’s functions are sited directly in the driver’s eye line. The large digital instrument cluster from the BMW 5 Series has an M-specific design and keeps the driver informed on the driving dynamic mode, M xDrive all-wheel-drive system’s setting and Drivelogic option currently engaged. Key elements here for the sporty driver are the variable rpm pre-warning field and shift lights that show the best time to change gears when in manual shift mode. This data can also be reflected into the M-specific Head-Up Display. Virtually all of the driving dynamic systems can be configured using the central touch display, buttons on the centre console or M sports steering wheel, and the central information display offers gesture control. The all-new BMW M5’s engine is stirred into life by pressing the red starter button. Among the essential features for drivers with sporting aspirations are the two red-painted M1 and M2 buttons next to the gearshift paddles on the M multifunction steering wheel, which allow drivers to configure two individual set-ups for the M5. These include their choice of M xDrive, DSC, engine, transmission, damper and steering characteristics, as well as the appearance of M view in the Head-Up Display. The all-new BMW M5 can be ordered in a variety of exterior colours, some of which are reserved exclusively for the M5. New additions to the spectrum include Marina Bay Blue Metallic, an intense shade of blue. Matt finishes such as Frozen Dark Silver and Frozen Arctic Grey can be specified as an option. Inside the car, exclusive aluminium applications with a carbon-structure provide a special sporting flourish. In the best of company: Previous generations of the BMW M5. The M5 has been the quintessential sports sedan for over 30 years. Since 1984, the BMW M5 has been a standard-bearer for fast high-performance sedans preferring not to shout about their sporting potential. The various generations of the BMW M5 have always possessed pure-bred racing genes and acquitted themselves impressively on the race track as well as on the road. The new BMW M5 represents the sixth generation of the super-powered 5 Series. And, like those that have gone before it, the new model promises to continue BMW M GmbH’s record of building distinctive sports cars that really can be used every day. Below is a brief look back at the five generations of the BMW M5 that have gone before. BMW Motorsport GmbH had already presented the M535i – a particularly sporty 5 Series – back in 1979 and followed it up with another M535i based on the E12’s successor (the E28) in 1984, before the first generation of the BMW M5 (the E28S) arrived on the scene in autumn that year. It was powered by the celebrated four-valve six-cylinder in-line engine with 3.5-litre displacement and 286 hp, which had also proved itself in race competition and was familiar from the mid-engined M1 sports car. Equipped with individual throttle butterflies, the engine powered the original M5 from 0 – 100 km/h in just 6.5 seconds and gave it a top speed of 245 km/h. That made the first BMW M5 the fastest four-door series-produced sedan of its time. 2018: The F90 BMW M5. The all-new BMW M5 (the F90) sees BMW M GmbH writing the next chapter in a success story which began over 30 years ago and is based on an apparently simple recipe: unbeatable sports performance and unimpeachable everyday usability brought together into one supreme package. The all-new BMW M5 is now available for viewing at the Performance Munich Autos showroom.